Tweed and Uber are proud to partner with MADD Canada in their effort to stop impaired driving in Canada. Don’t drive high. 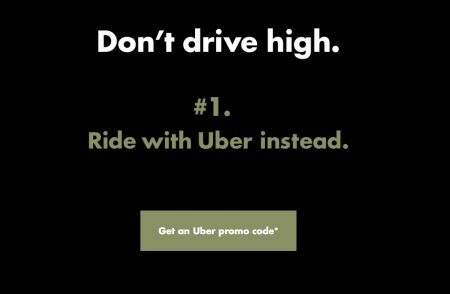 By making the smart choice to not drive high and ride with Uber instead, you’re helping the cause. Simply go to the website and fill out the short online form and they’ll email you a $5 off Uber promo code. Offer is valid for new and existing Uber accounts. I just did it and got my promo code right away. The whole process took less then 2 mins from start to finish. The offer is only valid in Alberta and Ontario for a limited time while supplies last. Once you get your promo code, it’s valid until November 11, 2018. BONUS: If you don’t have an Uber account, sign-up now first and enter my promo code uberDealsBlog and you’ll get $5 off your First Uber Ride! You can combine both offers if you don’t have an Uber account yet. This offer is valid for new Uber accounts only. Get up to $5 off your next Uber trip that is taken by 11/11/2018 at 11:59 pm ET. To get your discount, fill in and submit the above requested information. You will then receive an email from Tweed with instructions on how to get your promo code by visiting a Tweed web page. You must apply the promo code in the Payment section of the Uber app prior to requesting your ride. Discount/promo code expires on 11/11/2018 at 11:59 pm ET. Offer only valid in markets where Uber operates in Canada, excluding Quebec. Cannot be combined with other offers/promotions. Discount doesn’t apply to tips. Valid for new and existing users. Offer and terms are subject to change. Limited availability. Click here to sign-up for an Uber account now and get $5 off towards your first ride. Click here to get your $5 Off Uber promo code. Today (Saturday, September 29, 2018) is National Coffee Day! 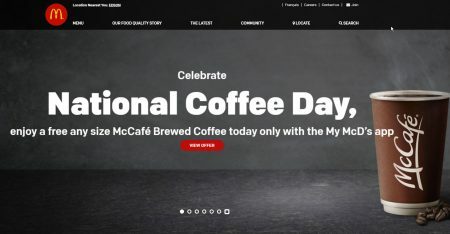 To celebrate, McDonald’s Canada is giving away FREE Any Size McCafe Brewed Coffee today only with the My McD’s app. You’ll need to display the free coffee coupon on MyMcD’s mobile app. If you don’t have MyMcD’s app, you can download it for free here (Apple App Store or Google Play Store). The offer is valid at participation McDonald’s restaurants across Canada on Saturday, September 29, 2018. Limit one offer per customer. Click here to download McDonald’s free MyMcD’s mobile app. Today (Friday, July 13, 2018) is National French Fry Day! 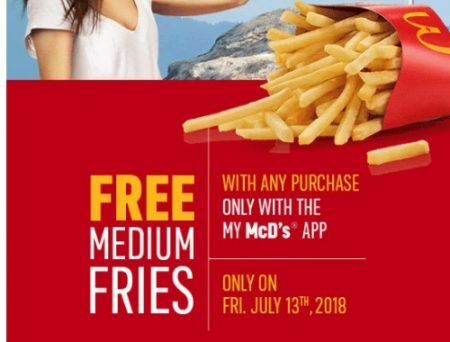 To celebrate, McDonald’s Canada is giving away FREE Medium Fries with any purchase with the My McD’s app on July 13. You’ll need to display the free fries coupon on MyMcD’s mobile app. If you don’t have MyMcD’s app, you can download it for free here (Apple App Store or Google Play Store). The offer is valid at participation McDonald’s restaurants across Canada on Friday, July 13, 2018. Limit one offer per customer. Minimum $0.50 purchase required. For the best deal, you can combine this offer with McDonald’s Summer Drink offer – $1 for any size soft drink. You can get a large soft drink and medium fries for only $1 plus tax. Yay! I love McDonald’s fries! 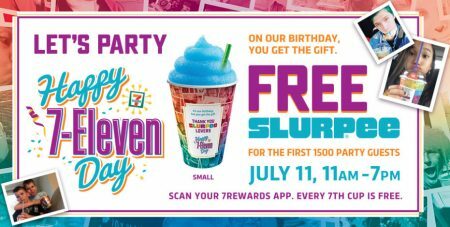 They’re celebrating their birthday today (Wednesday, July 11, 2018) by giving away FREE Slurpees! Visit your local 7-Eleven store and be one of the first 1,500 guests between 11am-7pm and get a free small (12oz) Slurpee. You don’t need a coupon or anything to get the freebie. Valid at participating 7-Elevan stores. Whiles supplies last. Click here to visit 7-Eleven’s website for more details. Click here to find a 7-Eleven store near you. 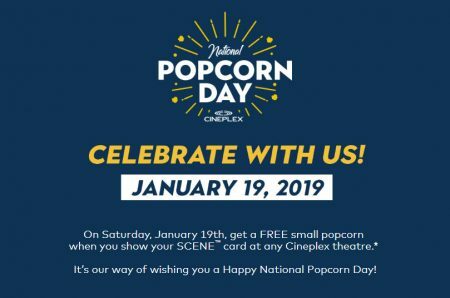 To celebrate, Cineplex is giving a Free Small Popcorn to all guests who show their Scene Card at any Cineplex Theatre. Offer is valid for 1-day only on Friday, January 19, 2018. SCENE card must be presented and scanned for offer to be claimed. 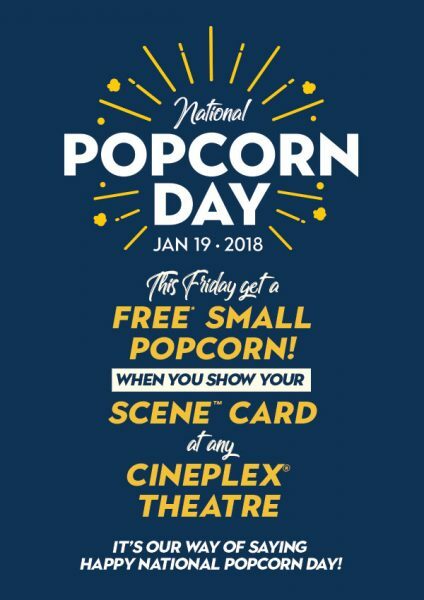 The offer is valid on January 19, 2018 only for one small bag of popcorn per SCENE member and cannot be combined with any other concession offers, combos or promotions. Click here to visit Cineplex’s Facebook page for more details.